Web Owls » Blog Archive » WoTY W00t! I’m going to try something bold, and see if I can post an image here…somehow, it never seems to go as smoothly as I hope it will. W00t! (not Woot) — a word I first came across in online groups just like this one — is officially the Merriam Webster Word of the Year (WoTY) for 2007. W00t! I think it worked! But…what the heck was going on in 2000!!!! Oodles of W00ts! at Millennium celebrations? 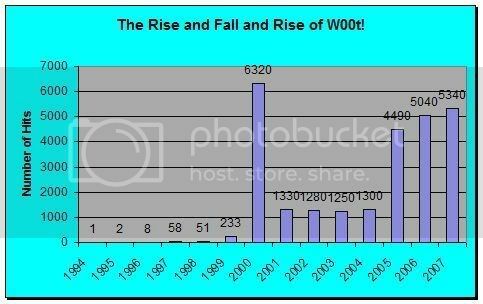 W00tsclamations about Y2K? Your speculations are actively encouraged. This entry was posted on Thursday, December 13th, 2007 at 5:38 pm	by pafalafaga	and is filed under Whimsy. You can follow any responses to this entry through the RSS 2.0 feed. Both comments and pings are currently closed.